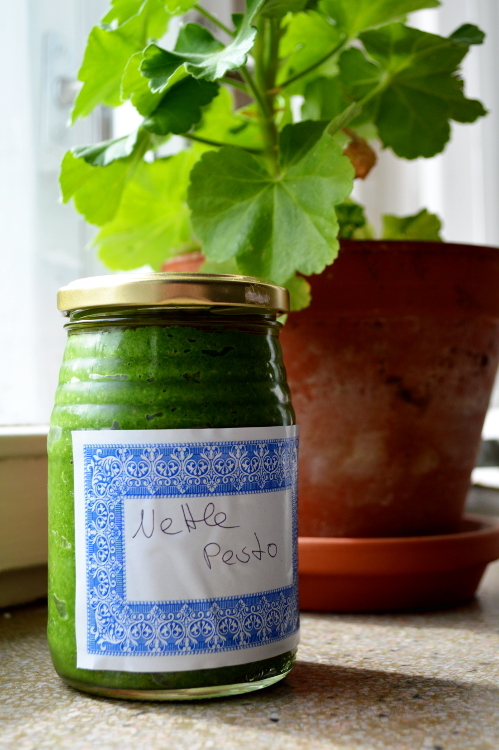 Last year Tiia had brought home a small bag of nettles and we decided to make pesto out of them. I have to say that I was a bit apprehensive at first since eating something that stings didn’t seem that appealing to me, but with some prep work nettles can be used in a lot of different dishes. The jar we had was gone in a week because it was so delicious! So this year I wanted to make a bigger batch. If you want to pick some nettles take some thick rubber gloves with you, a pair of scissors and a plastic bag or basket. 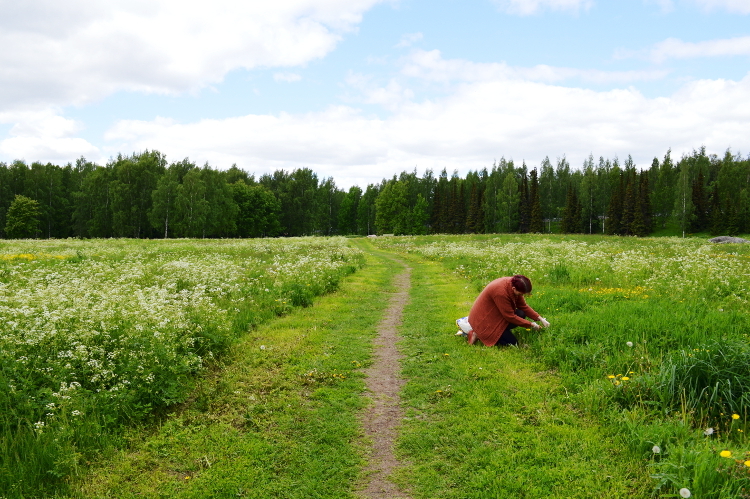 The best time to pick them is in spring when the plants are still small. If you go in the summertime and the nettles have grown more, just cut the upper 5-10 cm off. Shake them a bit to get rid of bugs. 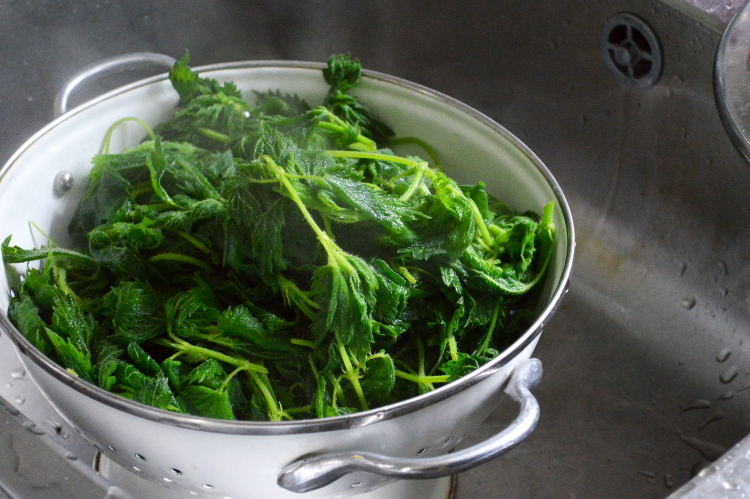 It doesn’t matter if the leaves a bit dirty, the nettles will be washed and boiled later. Depending on where you live you might come across the plant below. 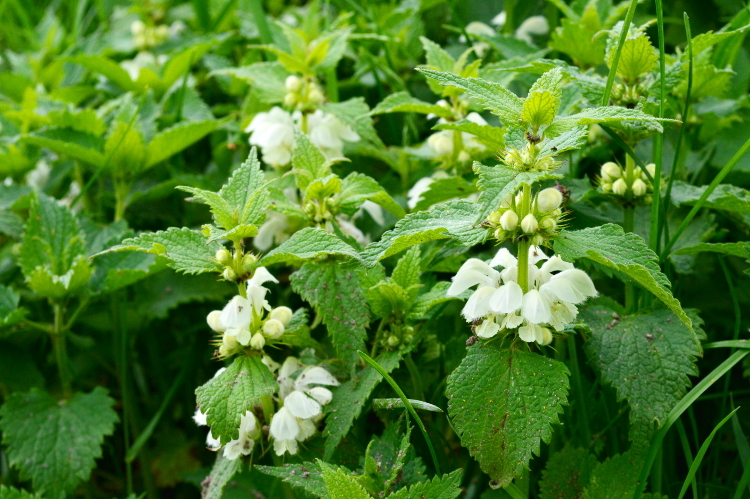 The white deadnettle (germ. weiße Taubnessel, finn. valkopeippi) looks similar to common nettles but doesn’t sting and despite the looks and name isn’t related to nettles. I heard they can also be used in salads or cooked but I don’t have any personal experience with them and they aren’t used in this recipe. 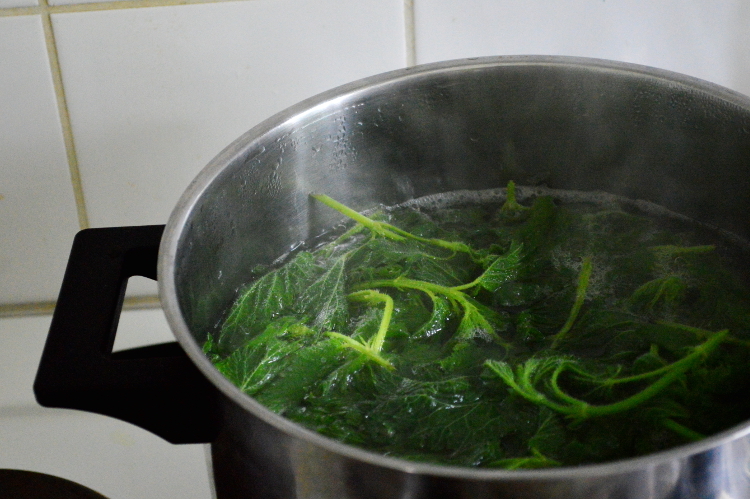 If you have picked a sufficient amount of the nettles you should wash them at home immediately with lots of cold water. I washed them four times to make sure all dirt and bugs were gone. Bring some water to boil at the same time and boil batch after batch for a few minutes before letting the excess water drip out in a big colander. After they’ve cooled down you can use a salad spinner to get rid of the remaining water. Don’t pour away the water you boiled the nettles in! Cooled down it will make a great fertilizer for your plants. Now the nettles are ready to be made into pesto. 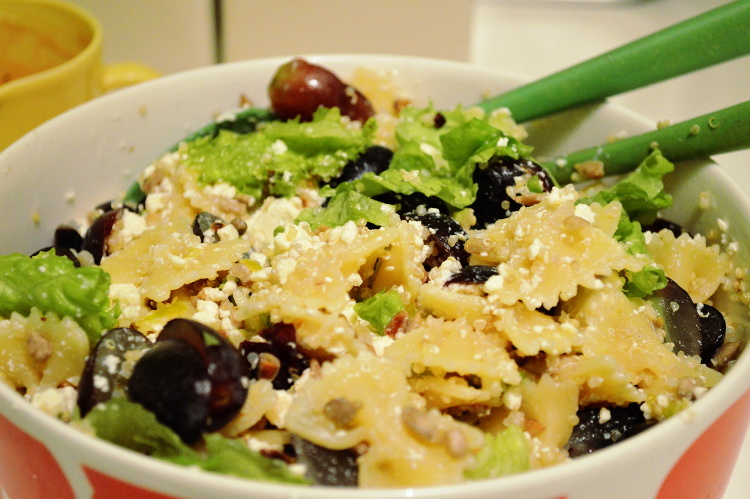 You can experiment with how much oil and parmesan you like. I found the pesto quite delicious when it’s not dripping with oil and doesn’t have too much parmesan. I picked around a kilo of nettles and it made a bit less than 2 l of pesto. Some will be stored in jars in the fridge or given away as a gift. I also froze a bit of the pesto for later. 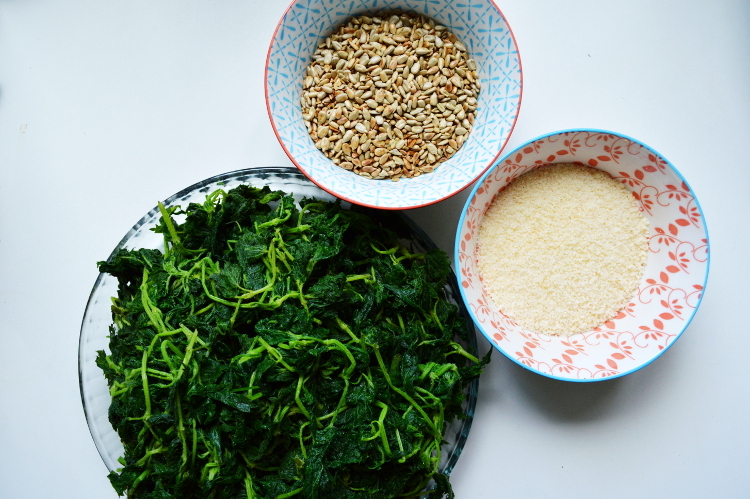 Roast the sunflower seeds in a pan without oil until they are lightly coloured and grate the parmesan. 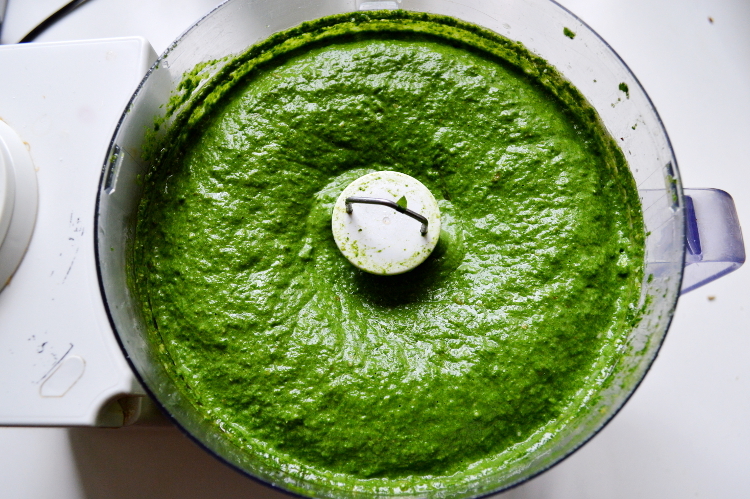 Blend the nettles with the garlic and the seeds in a food processor by pouring in olive oil carefully. 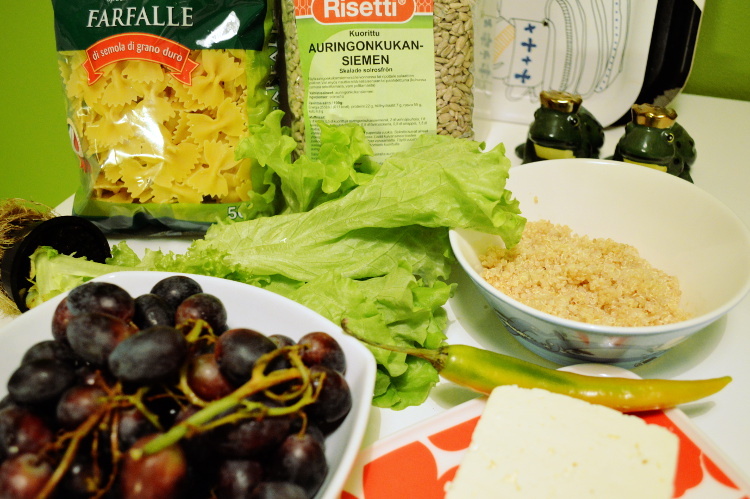 When everything is really smooth, add the cheese (or yeast flakes) and some salt and pepper. Taste the pesto and add more spices, garlic or oil if needed. If you want a vegan pesto but don’t want to use nutritional yeast I recommend using cashews in the recipe (increase the amount). They give a cheesier flavour to the pesto. Store the pesto in jars in the fridge. Make sure it’s always covered with a bit of olive oil to keep it from getting mouldy and always use a clean spoon or knife. This way it will be kept fresh for several weeks. 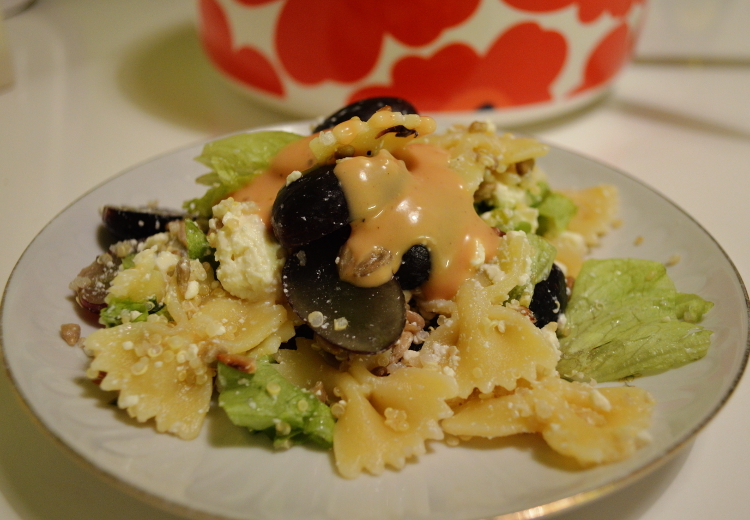 Enjoy with pasta, as a dip or on bread!